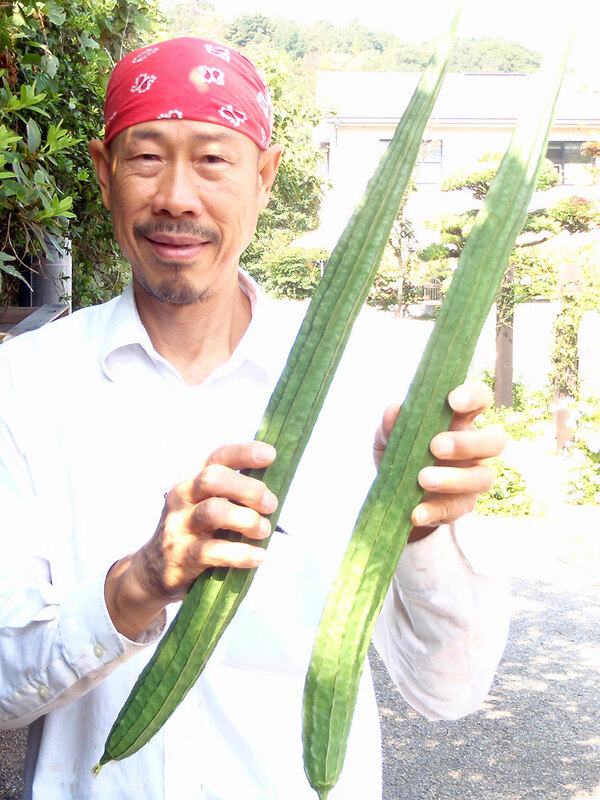 The gardener with two specimens of angled loofas, both about 70 centimeters long… (photo taken in Sept. 2011). Well, let us just say I am by birth, a paddy farmer’s son and had always harbored this affinity with the soil. I derive pleasure from touching and smelling the soil…I am passionate about vegetable and fruit gardening while my better half ‘Y’ finds bliss in caring for herbs and flowers.I consider myself to be a student-gardener, having planted only two seasons of vegetable crops thus far. I would count the number of vegetables grown so far to be around 40 to 50 types. What a beautiful blog! We have left Nara and now trying to grow Japanese vegetables – myoga, nasu, mitsuba, gobo, shiso, shishito, etc. in Colorado. The greatest gift I will carry from my 12 years in Japan is the flavor of these wonderful vegetables that I hope we can bring here.